Charles Philip Bailey was born on November 25, 1918 in the Bailey home that once stood on the corner of East Virginia Avenue and Wood Street, now a vacant lot. Know to family, friends and neighbors as Philip, Charles grew up on East Virginia Avenue and attended elementary and middle school at the Baker Academy in town. There was no high school for African Americans in Punta Gorda at the time, so Charles went to high school at the Howard Academy in Ocala, Florida. As Charles was growing up he was a paperboy for the local newspaper, The Charlotte Herald. Charles attended Bethune-Cookman College and while there, he enlisted, at the age of 23, in the Army Air Corps for a special aviation program and was selected for one of the early classes of the Tuskegee Airmen. Before 1940, African Americans were barred from flying for the United States Military. Civil Rights and black press exerted pressures resulting in the foundation of an all-African American pursuit squadron based in Tuskegee, Alabama in 1941. They were known as the Tuskegee Airmen. They overcame prejudice and became one of the most highly respected fighter groups of WWII and paved the way for full integration of the United States Military. As a 2nd Lieutenant and a Tuskegee Airman, Charles served in Italy and the European Theater. He flew 133 missions over Europe and shot down two German aircraft. He was one of only three African American pilots from Florida. Charles was highly decorated. He was awarded the Distinguished Flying Cross, four Air Medals and a Presidential Unit Citation. After his military service Charles became an educator with the Deland, Florida school system. He also became an undertaker and opened a funeral home in Deland. Charles married his wife, whom he met while at Bethune-Cookman College and they had two sons. Charles Philip Bailey lived the remainder of his life in Deland, Florida. The bronze bust of Charles P. Bailey was sculpted by Ralph Batten. It is the second casting of his sculpture; the first can be found at the Naval Air Station Museum located in the Deland Airport. The bust was paid for by a grant from the Charlotte Community Foundation. 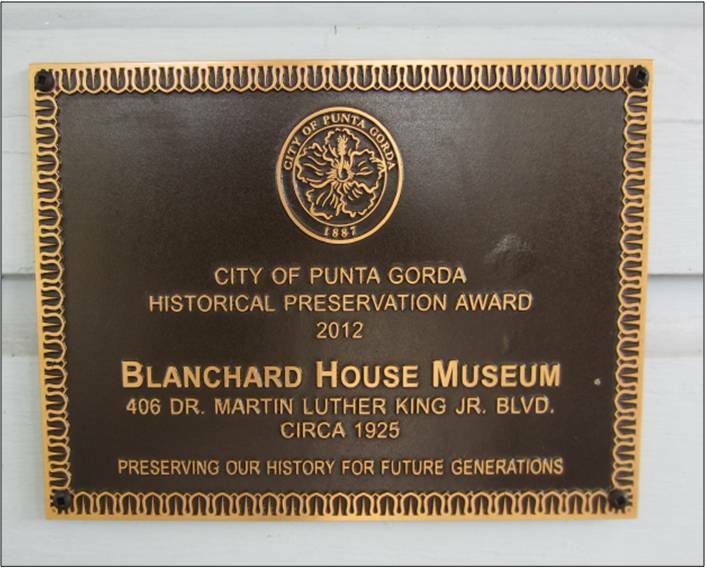 The grant funds also helped pay for the Blanchard House Museum’s Military Memorial Garden. In the garden is the brick walkway with bricks bearing the names of veterans from this country and others. The mural on the garden wall was painted by local children under the guardianship of the Punta Gorda Garden Club.